I’ve could have posted many photos, but this is what I remember most. The route had paved and unpaved roads. It had smooth and rough, hilltops and valleys, towns and wide open spaces. The biggest impression on this hot summer day, however, was the patch work on the gravel rollers of County Road 4010. I had mapped-out a low-traffic route to Decatur, Texas, and I’ve been wanting to try it out on the bike for months. Since my bride agreed to meet me there and drive me home, we did brunch in the County Seat. Why was CR 4010 memorable? I don’t know. Maybe it riding into the west wind. Maybe it was the steep, relentless gravel rollers. Maybe it was the frequent stretches of “repair work”. Do you see those lighter-than-normal patches in the photo above? Those are 2-inch deep patches of 1-inch gravel marbles. As I drifted (rolled) sideways across the road, I realized even my 42mm wide Hetres were not optimal for those areas. I’m not sure what is. Well I did find me a low-traffic route to Decatur. That should get me reasonable access to a future camping spot in the National Grasslands one of these days. Maybe in cooler weather. It’s low-traffic all right, but there are some challenging bits I won’t forget. Can you post added details? It looks like CR4010 was a fairly small fraction of the route. Steve, I just put the route up on Bikely…http://www.bikely.com/maps/bike-path/Bolivar-to-DecaturCR4010 was approximately 10 miles long. 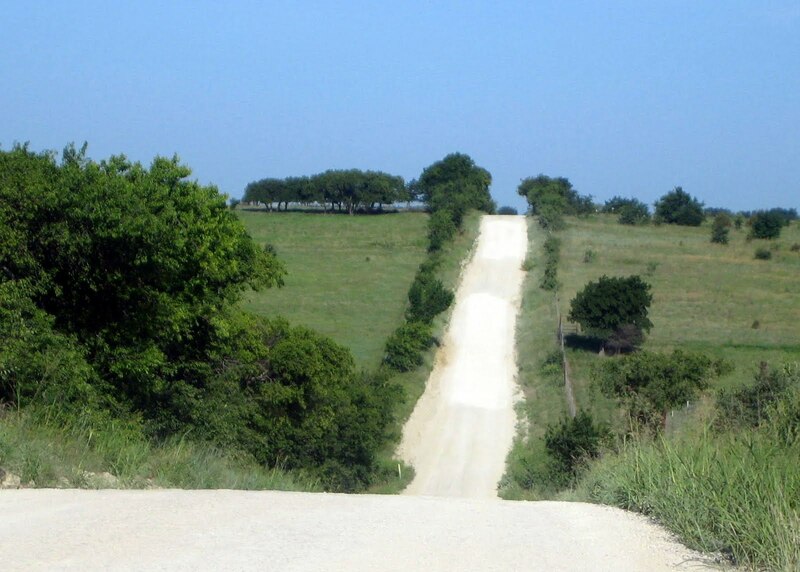 That looks like a nice climb in the photo.I can't recall having ever seen repair work on a gravel road. A Pugsley could get a person through those patches. Although it wouldn't be practical for any other part of the ride. I think the repairs were essentially filling holes. I think some of those marbles were really about 6 inches deep in places.Ah yes, the Pugs could do those marbles nicely. The AHH with Hetres worked pretty well everywhere else. It looks lovely! Usually gravel road "repairs" consist of re-grading (laying fresh gravel on top). Hopefully if they get some traffic through there, it'll help smooth things out. Not that there appears to be much traffic …Meeting the wife for lunch and a ride home is a great idea! My wife did some serious shuttling/support for me this weekend. We're very lucky to have supportive wives.